Here is a list of best free PDF shuffler software for Windows. These freeware are used to rearrange PDF pages within a PDF document. Also, you can rearrange pages of multiple PDF documents in some of these PDF shufflers. To shuffle and rearrange pages of a PDF document, these provide options including rotate, add, delete, crop, resize, reorder, etc. Many of these let you visually rearrange PDF pages. Additionally, you also get options to add watermark, edit and annotate PDF, add headers and footers, etc. in one of these PDF shuffler software. These software also provide additional features like merge two or more documents, split a PDF file, convert PDF to Text, image, or RTF, etc., add PDF security, etc. The changes made to a PDF can be saved in the original document. Sejda is my favorite PDF shuffler for Windows. It provides a wide range of options to rearrange PDF documents, plus lets you visually make changes to a PDF document. You may also like some best free Portable PDF Editors, PDF Annotators, and XPS to PDF Converters software for Windows. Sejda is a free PDF shuffler for Windows. It provides a feature rich set of tools to rearrange pages within a PDF document. While you do so, it provides a real-time preview of edited PDF. Hence, you can visually rearrange PDF pages. 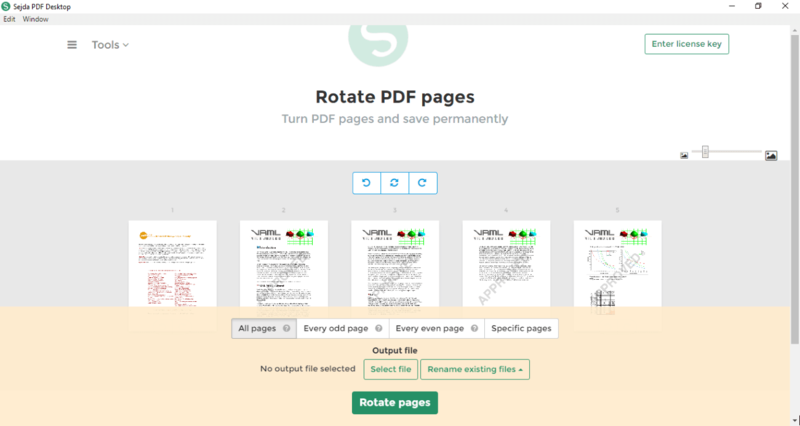 Rotate: You can rotate all, even, odd, or specific pages of a PDF document. Crop: It lets you crop PDF pages by setting left, right, top, and bottom margins. You can enable Flatten forms option to discard any editable form field. Resize: Here, you can add margins and padding and change the size of PDF pages. To resize PDF pages, you can either select a custom size or choose a standard page size such as letter, executive, legal, tabloid, etc. Delete Pages: As the name implies, you can simply delete desired pages from a PDF document. Watermark: To add a watermark to a PDF, use this tool. It lets you add text or image watermark to a PDF and adjust the position of the watermark on the PDF using mouse. Repair: It lets you recover data from a corrupted PDF file. PDF Editor: Here, you can edit and annotate a PDF by adding images, text, shapes, highlight/strikethrough, signature, links, etc. Bates Numbering: Here, you can bates stamp one PDF file at once. Header and Footer: Add page numbers or text as header and footers to a PDF. Other features provided in this software include Merge, Compress and Convert, and Split. Merge: Using this tool, you can perform alternate mixing of PDF documents. You can also visualize and reorder pages of multiple PDF files and then merge them into one. Compress and Convert: Here, you can compress size of a PDF file, password protect PDF documents, perform conversion like PDF to JPG and JPG to PDF, print multiple pages per sheet per paper, extract text from PDF, etc. Split: Using this tool, you can split PDF by pages, size, bookmarks, half, or text. Also, you can extract pages out of a PDF file. Office & PDF: Here, you can perform conversion like PDF to Word, Word to PDF, or PDF to Excel. PDF Shuffler, as the mane suggests, is a free and open source PDF shuffler for Windows. It is a dedicated utility to rearrange PDF pages. To do so, it provides tools including rotate, crop, delete, and add. As you open a PDF document in it, all its individual pages will be visible to you on its interface. You can zoom in/out PDF pages. From the interface, you can also shuffle pages within a PDF and reorder them by using mouse. You can open multiple PDF documents to rearrange their pages and then merge them into one PDF. You can rotate desired pages of a PDF by selecting them from the interface. It lets you rotate a page by 90 degrees either clockwise or anticlockwise. It lets you crop PDF pages by specifying crop margins (left, right, top, bottom). If you want to delete some pages of a PDF document, you can do that too. You can add up to 4 blank pages before or after the selected page of a PDF document. After rearranging PDF pages, you can save changes in the PDF. It is one of the best PDF shuffler software in this list. It is a straightforward and simple program which does well what it does. Also, this software comes in a package with a booklet creator software. PDFsam is another PDF shuffler for Windows. The basic version of this software comes free of charge, but with feature limitations. To rearrange PDF pages, it lets you rotate PDF pages. You can rotate all, even, or odd pages of a PDF document. In addition, you can rotate pages of multiple PDFs at once. Also, you can reverse the order of a PDF using Alternate Mix option. Other features provided in this software include Merge (merge multiple PDF documents or parts of them into one), Split (split PDF pages at given page numbers), Split By Size, and Split By Bookmarks. This is a simple and limited PDF shuffler for Windows. You can rotate all or selected PDF pages by 90 degrees left or right. It lets you crop all or selected pages by specifying position (center, top left, top right, bottom left, etc.) and width and height (in pixels, millimeters, or inches). Also, it lets you extract all or selected pages of one or multiple PDF documents. You can convert PDF to text, PDF to image, Image to PDF, and PDF to RTF. Merging two or more PDF files or splitting a PDF files into multiple parts is also possible. It lets you extract images and/or remove images from a PDF document. Plus, you can extract text from a PDF file. You can add security to PDF files by encrypting using a password and restricting/allowing permission like printing, modification, etc. Also, you can sign PDFs by adding a PFX file and owner and PFX passwords. You can also decrypt a PDF document. Also, you can add PDF metadata such as Author, Keywords, Title, Creator, etc. Note: This PDF shuffler is free for only personal use. PDFTK Builder is basically a GUI for PDFTK software. Using it, you can rearrange PDF pages in different ways. You can rotate pages of a PDF document in it. To do so, it lets you enter the page range and direction to rotate pages (clockwise/anticlockwise). It lets you add page numbers to a PDF or add another PDF file as background or stamp to a source PDF. It also provides the flexibility to add page number, background, or stamp only to the first page of a source PDF. It also lets you split or join two or more PDF files. It also lets you add security to a PDF document by specifying Owner and User passwords. Also, you can restrict or allow different actions to be taken on a PDF including Printing, Content Modification, Copy Content, Annotation Modifications, Fill In, etc. All in all, it is another nice and open source PDF shuffler software to rearrange PDF document. PDF Rider is another PDF shuffler which let you rearrange PDF pages. It lets you visually rotate, insert, delete, and extract pages of a PDF document. Also, you can merge PDF documents. Some additional tools provided in this software include extracting PDF pages and adding security to a PDF file by assigning open password, edit password, and restricting permissions like printing, modifying, copying content, etc.